For the Woman on the go who still would like to gleam a winning sophisticated look. Medium length hair can be straightened in 7-10 minutes. Hair feels shiny, silky, healthy and lustrous. Positive Temperature Coefficient (PTC) Heating have self-Limiting Temperature Characteristics, fast heating time and heating plateau once at pre-defined temp is reached thus prevents hair burning. Has even heat distribution and quick temperature recovery time. Built in ionic unit emits upto 6000000 negatively charged atoms and molecules that interact with molecular particles in your hair. Thus sealing the hair cuticle, reducing frizziness, split ends, knotting, increasing hair manageability, leaving hair silky and lustrous! Quick heating time. 5 Temp settings. LED screen indicates set temp. Options 150c (300F), 170C, 190C, 210C, 230C (450F). Detangles and a hair straightener all in one. Dual voltage good for travel. Simple and Elegant. - Ergonomic Design with 360 Rotatable Power cord convenience. Timed Auto Shut-off Function after 60 minutes, if left unattended. Best for thin, fine hair but also suitable for thick, frizzy, dyed or treated hair (adjust temp accordingly). 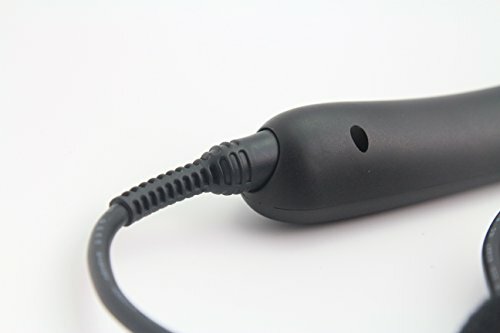 Blade shape detangles but does not pull on hair. No broken or flyaway hair. QUICK - FAST - EASY: Best for Woman on the go. Saves time compared to regular hair straighteners. For a sophisticated look this hair straightener is ideal. For medium length hair straightening takes 7-10 minutes ( fine hair ) for good results. Hair feels shiny, silky, healthy and lustrous. TEMP SETTINGS: quick heats up time due to PTC heater. LED built-in screen shows temp settings. 5 Temp options ideal to straighten hair of various textures. VERSATILE FOR ALL HAIR TYPES: Suitable for thick frizzy fine dyed or treated hair. FUNCTIONALITY: Ionic function built in this dual voltage 2 in 1 brush comb straightener. Simple Elegant and sturdy design. Out standing quality and better than most cheap hair straighteners in the market. Detangles but does not pull on hair. No broken or flyaway hair. 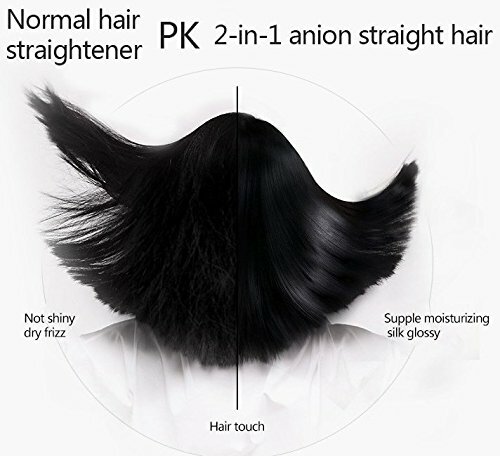 TECHNICAL SPECIFICATIONS: PTC Heating Ionic Hair Straightener w/Built-in Ionizer. 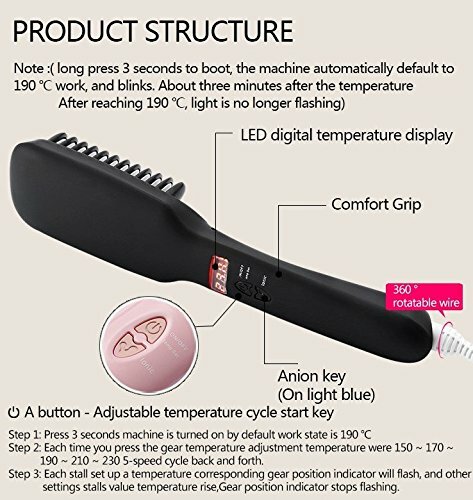 5 temp setting , dual voltage makes ideal travel hair straightener . Long cord for ease of use. Anti Static Anti Scald Advanced Insulation Design helps protect against accidental contact with scalp. Up to 6000000 negative ions/cm3 Non damaging to hair. 360 degree Rotatable Power cord convenience. SAFETY: Timed Auto Shut-off Function after 60 minutes if left unattended. Donot use near water.